Review Summary: Tabu amazes in this worthy remake of the Malyalam film. Drishyam pays off with fantastic execution! It Is A Remarkably Resonant Remake! Alas, nothing comes of it and we never get a battle between equals. Perhaps because she’d have eaten him alive: lug, luggage and all. s they say, good things come to all those who wait and in the case of 'Drishyam',Â you will have to wait through the initial snail paced part and once you pass this phase you will be rewarded with a relishing brain twister which is a must watch for all those who love good cinema. You only see what your eyes want to see! The layers that made the original Malayalam movie so enjoyable are absent, but the Hindi remake coasts along on its winning premise. Drishyam could've been crisper (runtime: 163:33 minutes) and woven in a few more tricks and surprises. But it is only a lazy remake and a lot is lost in translation. Regurgitating a tried & tested template of a successful Malayalam film, Drishyam becomes a gripping, layered watch in it’s second half. Tabu is brilliant, & Rajat Kapoor complements her ably with a subtle act. This film is a must watch for Ajay Devgn and Tabu’s electrifying performances! For anyone who has not watched any of the other versions Drishyam would be a welcome addition to the range of cinema that the month of July has sprung out. I am most itched to tell you about the murder, about the missing dead body and sundry. But I would suggest you watch the film. Don’t miss the last scene. It’s the kind of masterpiece one expects in a thriller, murder mystery. So given the expectations we went with, we were a little underwhelmed. So here’s a tip — don’t let the original’s reviews colour your expectations. 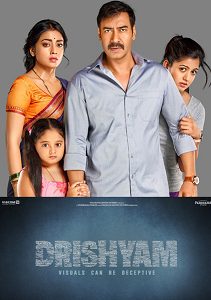 DRISHYAM is an absolute winner that keeps you hooked completely right till the end. It is definitely a must watch movie this weekend. But there are intense scenes she sleepwalks through in terribly distracting falsies. Drishyam is nifty and is all about the nail-bitingness that edge-of-the-seat stuff are made of. Or if you're an Ajay fan. Ajay Devgn-Tabu's Thrilling Performance Keeps You Hooked! But do watch this film for Ajay and Tabu’s performances and of course, that one-in-a-million story. Content, after all, is the key. The film is worth watching for Ajay’s and Tabu’s performance and the engaging battle of wits between their characters. Ajay, who is the prey here, shines in his role of the protective father. While his family definitely needed to be cast in a more discerning fashion, half a star in this review is reserved for Tabu, who is outstanding as his predator. Drishyam isn't a shot-by-shot remake of the Malayalam film and in that may lie some of its problems. Stunning, gripping, edge-of-the-seat, shocking, engrossing... use any of these adjectives for this Ajay Devgn version of Drishyam, and you are spot on. Right now, it just gets a mild thumbs-up. Drishyam is everything a Bollywood film should be – smart, hard-hitting and story-driven. It’s a must-watch, especially if you enjoy suspense films! Seeing is believing.. watch 'Drishyam' to see the actor Ajay Devgn returning to his intensity best in this emotionally packed powerful, faithful, pulse riser, powered by superlative performance that envelopes a relevant message of morality and upbringing.